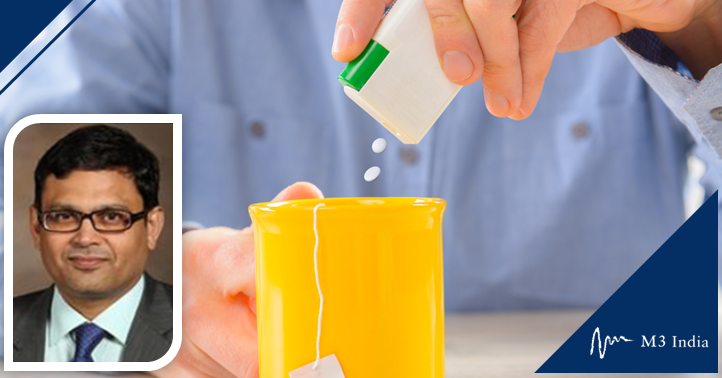 In the Sunday Series we bring to you another popular article from our archives where Prof. Dr. Sundeep Mishra picks ups a common patient query about the use of artificial sweeteners. While it was assumed that artificial sweeteners being low in calories would be helpful in glycaemic control in diabetics, the use of aspartame and sucralose instead of decreasing blood sugar actually causes paradoxical postprandial hyperglycaemia with accompanying postprandial hyperinsulinaemia, possibly increasing insulin resistance. Sugar-free artificial sweeteners have been considered beneficial for diabetics as well as obese individuals wherein they can provide sweetness to food without elevating blood sugar levels or adding calories. Saccharin was discovered by an American German scientist Fahlberg who while working with compound radicals and substitution products of coal tar, forgot to wash his hands after working long in his lab and found that his bread was inordinately sweet and the napkin holding it was even sweeter! Interestingly, saccharin a non-nutrient sweetener found its use as a low-cost substitute for refined sugar during the World War I & II when due to agricultural crisis sugar production was falling. Since then several sugar-free substitutes have become available: aspartame, neotame & sucralose are a few refined products but stevia, yacon syrup, maple syrup and of course honey are some of the natural products. Not only are these sugar-free sweeteners available as syrup, pellets, sachets for use as sweeteners of food products but they can be found in more than 6000 food products across the globe, particularly cola-drinks and are now more commonly consumed than imagined. Closer home, a study conducted in Lucknow, revealed that even in children of age group 6 to 10 years, consumption of artificial sweeteners exceeded Accepted Daily Intake (ADI) by 54% (due to consumption of ice candies and crushed ice). A large meta-analysis of prospective studies involving ≈40,000 cases revealed that artificial sweeteners could actually increase the risk of diabetes mellitus (rather than decreasing it). More importantly, there seems to be a gradation of risk depending upon year of consumption and amount consumed per day. The latest ACC/AHA guidelines also recommend a word of caution with the use of artificial sweeteners as a means of calorie restriction. Several efficacy and safety concerns have come to light with the use of these agents. The main problem with stevia is the bitter after-taste of the product. Furthermore, while stevia is available as liquid drops, packets, dissolvable tablets and baking blend, but the matter of fact is that most data pertains to purified leaf extract only. Maple syrup has much lower fructose content than agave (another natural sweetener), adds a pleasant flavour to foods, and is great for baking. Unfortunately, it is high in fructose which might affect the hormone leptin and could contribute to overeating and weight gain. It is sold in light, amber, dark, and raw varieties.